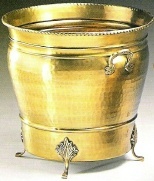 Solid brass umbrella stand 8.5"W x 22.5"H (overall to top of handles). Antique finish is lacquered to resist tarnishing. Solid cast brass feet and handles. Openwork design of this stand allows umbrellas to dry faster. 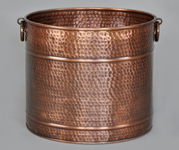 Solid brass umbrella stand in exquisite hand-cut openwork design. Beautifully detailed cast brass handles and Queen Ann style cast brass feet add to the elegance of this piece. The antiqued finish is hand rubbed and then lacquered to resist tarnishing. The openwork design enables air circulation so umbrellas dry faster. Dimensions 22.5" Height (measured from floor to top of side handles). Diameter of top opening 8.5." 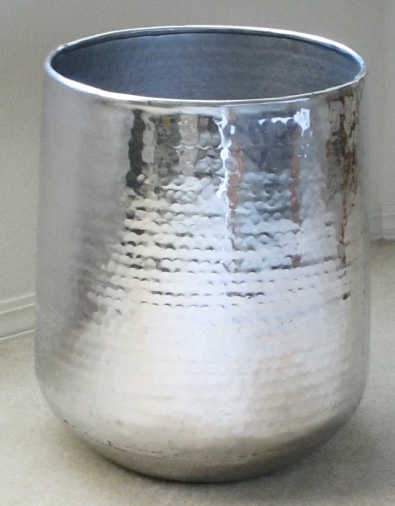 Diameter across top measured from the outer edge of the handle to the outer edge of the opposite handle is 11.5." 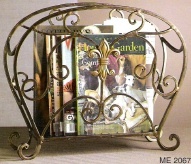 Substantial solid brass construction for durability. An Excellent Accents exclusive !